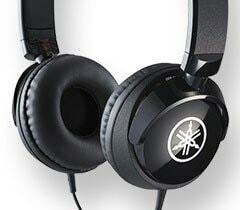 The Yamaha HPH-50B are simple, compact headphones that let you enjoy professional-grade sound quality at price that won't strain the wallet. Featuring a swivel mechanism that allows the driver unit to turn 90 degrees to fit the angle of your ears, and a headband that allows smooth adjustment of its, HPH-50 earphones are designed to provide a comfortable, stress-free listening experience, hour after hour. Available in black, and featuring the Yamaha logo on the housing and headband. The 2-meter cable allows easy connection to your musical instrument, and features a detachable standard stereo plug (6.3 mm) that can be connected to various instruments. Gold-plated plugs that are resistant to deterioration are used for all connectors.